Texas is not a typical vacation destination for Seattleites. But, as we resume our quest to visit all 58 National Parks, the desert sun sounds appealing amid the dark damp days of November. Cowboy hat and boots packed, we are off to explore west Texas and visit three Parks. A two hour flight to Phoenix, followed by an hour flight to El Paso and a five hour drive south gets us to Big Bend. Established as a National Park in 1944, the Rio Grande River makes the “big bend” at the southern tip of west Texas. It creates the border between the US and Mexico. We know we are in for a treat when the geology graduate student upgrades our rental car just because he wants us to enjoy Big Bend. The town of Alpine is our destination for the night since we can’t make it all the way in one day. There are several small towns about 30 miles apart built in the early 1900’s along the east west railroad line. Alpine is one, along with Marfa and Van Horn. As we head south on highway 118 through desolate desert several odd sights keep us entertained – including a sculpture of a Prada store outside of Marfa in the middle of nowhere. We awake to sunshine after moving two time zones and “falling back”. Seventy-five degrees and sun is the forecast the entire time we are in Texas! The 43 mile, Ross Maxwell Scenic Drive, in the southwest section of the Park is the perfect introduction to Big Bend. Yucca, creosote bushes and ocotillo cacti are the main vegetation in this “high desert” after ranching scoured the landscape of all natural grasses. Summer temperatures are over 100 degrees. Today it is still in the high 80’s. We quickly learn that the Rio Grande is no longer “grand”. Eighty percent of the water is utilized by the US and Mexico for agriculture and municipalities. Because the water level is so low, “river trips” include carrying one’s canoe through mud. We “pass” on this adventure, disappointed. Instead we enjoy the 1.7 mile hike into the Santa Elena Canyon which is an impressive display of what the Rio Grande created long ago. We follow a well-built stone trail which ascends giving us a spectacular view into the canyon. Granite walls tower above the River 1,500 feet. We find that even soft whispers echo clearly through the deeply carved canyon.Beautiful tall grasses greet us at the River’s shore once we descend to the Rio Grande itself. After our short but very scenic hike,we complete the drive via Old Maverick road - 13 miles of easily passable non-paved road. At the end of the road in the opposite direction from day one - southeast - is a nice 1.4 mile hike into Boquillas Canyon. The Rio Grande has a nice sandy beach here. But, we aren’t sure why there are “wild” horses walking around in the shallow River. Experiencing the US Mexican border makes quite an impression. Border patrols litter south Texas. Large border stops are on most highways heading north. Warnings about illegal river crossings are all over the Park including in Boquillas Canyon. Outside the park barb wire fences are prevalent. Border patrol even sits outside our hotel. We are staying at Lajitias Resort and Spa just west of the Park because I was ready for a “spa” in addition to a National Park. It is not quite as advertised so we opt to move to Chisos Basin early. The Basin is the center of the Park and the Chisos Mountains surround it. A former inland sea, volcanic activity formed the Mountains. It’s a geologist’s wonderland. Names like Mule’s Ears and Casa Grande perfectly describe these highly irregular peaks. Since the Basin is at 5,400 feet it’s 15 degrees cooler than the desert - yeah. Lodging is modest but very comfortable with “60’s” styling. It’s the only lodging in the Park. Food is simple but fresh and healthy. The dining room has a fantastic view of “the window” a V in the mountains which is the primary conduit for water escaping the Basin. A favorite time here is sunset. The reflecting light showcases the brilliant orange color of the 7,000 foot peaks surrounding the Basin. Everyone gathers for the view but also to get “access” on all their (or should I say “our”) electronic devices. I am not sure if that is a good or bad thing on a National Park trip. After the sun sets, it’s time to watch the 2012 election results. The only choice is the TV in the small, dark bar next to the restaurant. So we settle in. Emory Peak, the highest spot in the Park is our destination today. It is 10.5 miles round trip with 2,400 feet of vertical. Sun, heat, rock and altitude seem to make the hike feel harder. Views of the Basin, “the window” and the surrounding peaks are a great reward. Bear, mountain lions, tarantulas, javalena and lizards are all common in the area. It’s also a birder’s paradise. I am very happy we don’t run into a bear or mountain lion. (Maybe my “annoying” bear bell helped.) 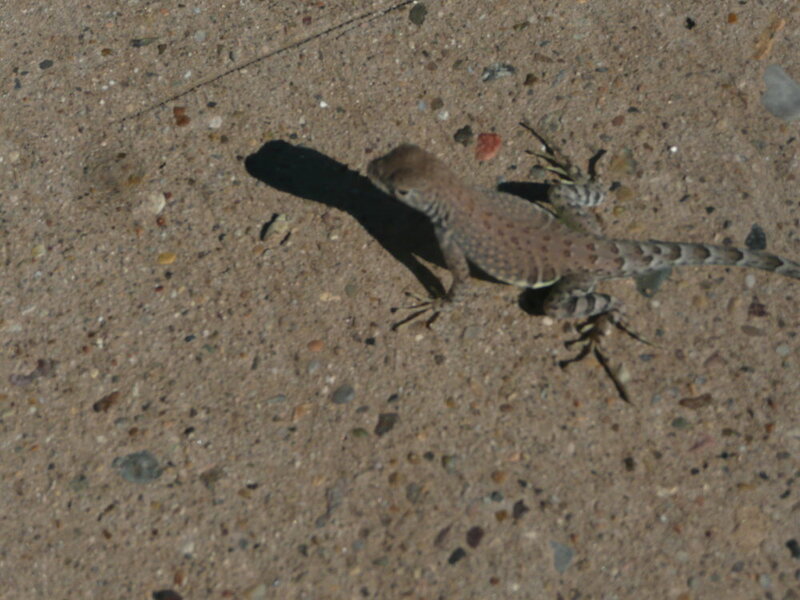 But, we are fascinated with the fury tarantula crawling along the trail and love seeing the cute lizards scurrying about. We decide we can’t leave Chisos Basin without taking the short two mile hike to “the window” or V in the mountains which we have been admiring. The trail to the “drop off” where water escapes the basin follows Oak Creek through grass, trees, and small canyons. The view is spectacular at the bottom of the V or the top of the “drop off”. The rock has been worn smooth from the water flow. It’s slippery so we keep a safe distance. The hike back out is uphill 500 feet and best completed without the mid-day sun. We enjoy lunch, our last meal in the dining room. We gaze out at the view of “the window” with an even greater appreciation after our hike. We say goodbye to Big Bend, an unexpectedly special place. As we drive into Van Horn we see the renovated historic El Capitan Hotel. We decide to give it a try for dinner. We learn there were originally five Spanish style “Gateway Hotels”, designed by Henry Trost in the early 1900’s. El Capitan is one. We enjoy angel hair pasta with shrimp and a spinach salad with carrots, apples, goat cheese, and pecans, dressed with a lime and cumin vinaigrette. We can’t resist the pecan pie, a specialty in Texas. Today we have a short drive further north via highway 54 and then highway 62 to the Guadalupe Mountains. The Park borders New Mexico. Guadalupe Peak, the highest point in Texas at 8,749 feet, dominates the landscape with its massive “wall”. Formerly an inland sea reef, the Guadalupe Mountains jut up very prominently in the middle of the desert - another geologic wonder. Due to our late arrival and 60 mph winds we select the McKittrick Canyon for our hike versus Guadalupe Peak. We follow the rocky river bed through the canyon on this fairly flat 6.8 mile hike. Fall colors created by the oak, juniper, madrone and maple trees make it popular this time of year. The wind is howling even in the canyon today. Wallace Pratt, an oil man, owned the area and built a lovely stone cabin (a nice halfway stop) prior to giving the land to the park system for all to enjoy. We drive a little further North to Carlsbad, New Mexico to spend the night. Although the town is not appealing to me, we find the Trinity Restaurant, in a renovated bank. The lasagna and ravioli are excellent. We are disappointed to find out the La Caverna, one of the “Gateway Hotels” where Tom stayed growing up, was razed back in the 80’s. John White, a 16 year old cowboy, first explored the caves with only a lantern. He was so intrigued that he dedicated his life to sharing them with others. He began by bringing the first photographer into the caverns to convince other of what he had seen. Established as a National Park in 1930, they became a World Heritage Site in 1955. The caves are overwhelming and overwhelmingly beautiful. The 1.25 mile paved path, the “natural entrance”, descends down 800 feet or 75 stories. As we descend I panic as we lose natural light and sight of the entrance. But, I continue down with Tom via the steep dimly path which he traveled several times growing up. Once in the “big room” (14 football fields long) I calm down realizing that the caves were formed 250 million years ago and thousands have visited since. They even have bathrooms, a snack counter, and a small gift shop down here! We explore the “big room” via a 1.25 mile flat circular path. Spectacular formations, stalactites (c=ceiling), stalagmites (g=ground/floor), draperies, soda straws and columns create quite a show. Calcite crystals formed the scenery drop by drop over millions of years when the climate was wetter and cooler. After exploring the “big room” on our own, we are treated to a tour of King’s Palace, The Green Lake Room and The Queen’s Chamber with Eric an enthusiastic Ranger giving his first cave tour. During the tour he turns out all the lights and we get to experience complete and utter darkness. We exit the Caverns via elevator because hiking out is not allowed after 2:30pm. As we leave the visitor center, the sky is filled with what looks like fog or smoke. It is dust from the high winds. The drive back to El Paso is a bit eerie in the dust storm. The Doubletree, El Paso is a great hotel especially for the price. We spend our day on a self-guided walking historical architectural tour. We learn that El Paso, a border town was very vibrant in the early 1900’s primarily due to the railroad. The architect, Henry Trost designed many of the fantastic buildings in a variety of styles. Our final day ends with a “Tex Mex” meal in a strip mall. Oh well. As we head home, we know we are “hooked” once again on our goal of seeing all 58 National Parks. With 19 “down” and 39 “to go” we are clearer than ever - it’s not the “goal” driving us. It’s the exploration of amazing natural wonders in their original state inspiring us. Who would have thought Texas would have been so rich? As we wait for our flight I find a “web special” and book it. I can’t imagine a better way to start the New Year than at Saguaro National Park in Tucson, Arizona – our 20th National Park.